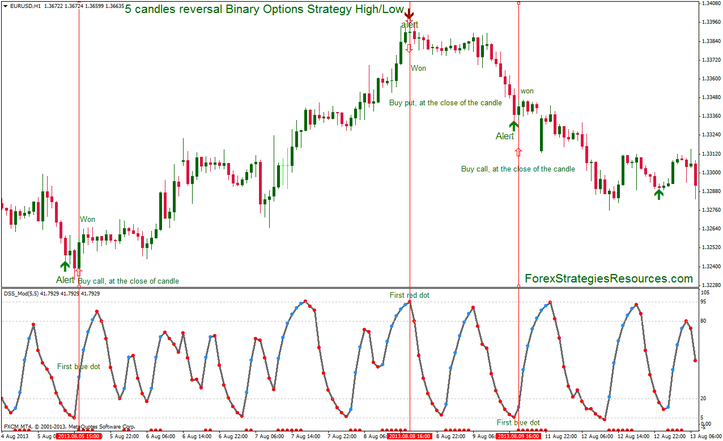 This Binary Options Strategy High/Low is based on the reversal indicator (setting: four candles and Roby DSS Bresser colored indicator set(5, 5). Time Frame H1 Expires Time: 120 min or 60 min (prefferred). Commodities: Gold, Silver, and Crude Oil. Set your Roby DSS Bresser colored indicator (5,5). Open simultaneously at least 10 charts. Wait appears the first blue dot of Roby DSS Bressert colored indicator and buy call al the close of the same bar. Wait appears the first red dot of Roby DSS Bressert colored indicator and buy put al the close of the same bar. Expires Time: 120 min or 60 min (preferred). 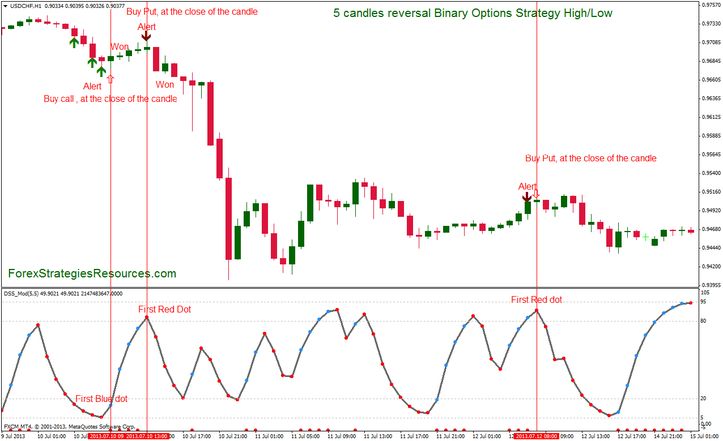 In the pictures below 5 candles reversal Binary Options Strategy High/Low in action. The Roby DSS Bresser colored indicator REPAINT!!! How do I get access to the indicators for strategy #27?